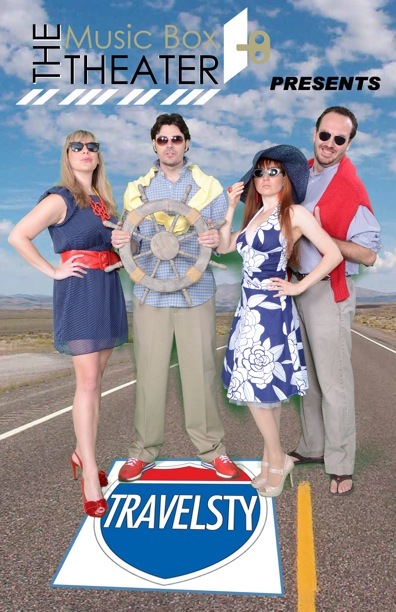 YourHoustonNews.com The summer travel season is fast approaching, and if gas prices are keeping you close to home, you may want to stay local and simply head over to Houston’s reigning musical comedy club, the MUSIC BOX THEATER, where you can enjoy a clever vacation spoof titled, TRAVELSTY. One word of warning though: The night I attended, the room was completely Sold Out so be sure to make reservations in advance. With the aid of video postcard projections, the first stop on this cross-country trip is the state of Georgia. Rebecca’s soaring, “Midnight Train to Georgia,” launched the show like a rocket and had solid backup from the gang. Brad followed with a lush, “Georgia on My Mind” that was as dreamy as he is good-looking. Smartly mounted, it rose to dazzling heights with just elegant accompaniment on guitar. The action moves on to New York where Cay does an amusing turn as a crotchety old woman in a rooming house who is reminiscent of Fruma Sarah in Fiddler on the Roof. Cay and Rebecca join in a fine counterpoint medley of New York/Empire State of Mind with shadowy rose lighting adding to the glow (Tech director, Pat Southard). The band gives a solid performance (music director, Glenn Sharp) as Brad & Luke deliver a thrilling, “Where the Streets Have No Name.” Then it was on to a goofy group of Brooklynites (oh, those accents!) who meet on the Coney Island Boardwalk. They break into a heavenly a cappella version of “Under the Boardwalk” that had the kinds of mouth-made sound effects that made the Mills Brothers famous. Cay returned for a breezy “Anywhere I Hang My Hat is Home,” with the band smartly laying low to keep the spotlight on her fine voice. It’s on to the West Coast as Brad leads a “Hotel California,” featuring some cute comic bits and a well-done touch of strobe light slow-motion. Then the group nicely tips their hats to John Denver with, “Rocky Mountain High” and a rousing “Country Roads” that brought the show to an intermission with plenty of drinks and snacks available at the bar. Act Two opened with a fine rendition of Duke Ellington’s “Take the ‘A’ Train” from the band, and then it was off to the merry harmonies of “Route 66,” as the cast returned to the stage and our trip lands us in Tennessee. That gave Luke a chance to show his real gifts as a singer/storyteller with his powerful version of, “Graceland.” The silly airplane sketch that followed had hilarious moments with Brad as an impish lad traveling on Obstructed Airways. That led to the hypnotic harmonies of “Leavin’ on a Jet Plane,” from the trio of Cay, Brad & Luke. Rebecca has a knockout with the “Travelin’ Prayer,” and as we arrive in New Orleans, Brad jumps from bass to falsetto in a richly crafted, “House of the Rising Sun.” Luke portrays an affable drunk with a full bladder, as Cay offers a sassy and seductive, “Basin Street Blues.” And don’t miss Luke’s impression of Louis Armstrong. It’s a real winner. Next stop is San Francisco with another clever skit featuring a mocking Hippie Trippy Trolley Tour with Rebecca as an eco-friendly, sourpuss tour guide who stands for every environmental extreme imaginable. Carol Burnett would have loved playing this part. Luke brings plenty of Tony Bennett mannerisms to the song, “I Left My Heart in San Francisco,” while Brad clowns around with great physical comedy take-offs of Dean Martin, Julio Iglesias, Charlie Chaplin, Mick Jagger, and finally a hilarious gobbling turkey. With some funny reflections on her hometown, Rebecca takes us next to the city of Detroit as she delivers another thriller with, “Hometown Glory.” With sounds like this, this gal could be on a real cross-country concert tour, but let’s hope we can keep her here in Houston. Of course that would be our last stop as Brad smoothly sang the Dean Martin hit, “Houston,” and then moved right on to a great, “King of the Road.” Luke’s final number, “I Got a Name,” once again displayed his ability to theatrically connect with the audience. TRAVELSTY continues through August 4th at The Music Box Theater, 2623 Colquitt in Houston, Texas, with performances Friday & Saturday nights at 8 pm and Sunday matinees at 2 pm. For tickets & information call 713-522-7722 or visit the website at www.themusicboxtheater.com . This entry was posted in Comedy Clubs, Nightclubs, Theater Reviews, ThePeoplesCritic.com and tagged clubs, comedy, Entertainment, Houston, music, Music Box Theater, nightclubs, Reviews, Texas, theatre. Bookmark the permalink.